Summer has arrived in full force this past week here in central Italy. We went from temperatures in the 80’s last week to the low 90’s this week with days of constant sunshine. For these two former desert dwellers this wouldn’t be so bad if not for the humidity; I firmly believe “dry” heat is more comfortable than “wet” heat. The spring had been very wet and the green fields, flowers and busy farmers will attest to that. Last year at this time we were just beginning to contend with a hot and dry summer that included water shortages and a regular rash of forest fires. This summer it appears water shortages and forest fires will not be an issue, though it is still early. One of the signs that we have had such a wet spring is the level of the lakes. 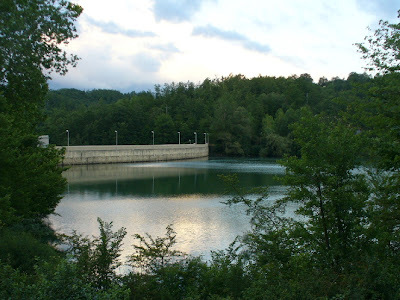 Near Amatrice along the Via Salaria is Lago di Scandarella, a reservoir. Last spring the water level was several meters low and a good portion of the concrete dam was visible from the lake side. Two weeks ago we drove by there on our way back from Roma and now the lake is full. We may have water in the lakes but unfortunately the comune still has not turned on many of the charming fountains in the centro storico. Another big difference this summer has been the lack of the smell of forest fires and the drone of the canadair planes.